This image is a 2 panel mosaic showing a little over 6 by 6 degrees of a section of sky only 9 degrees south of the North Celestial Pole. It shows a portion of the IFN in the constellation of Cepheus known as the "Cow Nebula" or MW7 (Mandel-Wilson Catalog of Unknown Nebula #7). 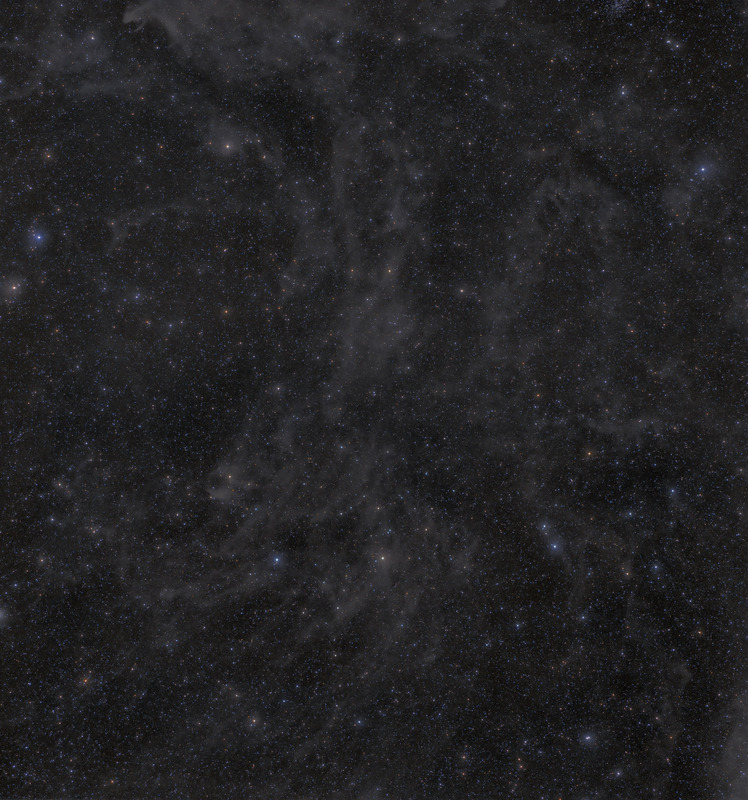 While the nebula is quite faint, it is one of the denser parts of the IFN. This image has been processed so as to bring out the nebula from the background sky. Included in this image is the pretty open cluster, NGC 188 (at the top edge towards the right side of the image). Software Used Images Plus 5.75 for camera control, calibration, stacking, digital development, star shrinking, smoothing and noise reduction, multiresolution sharpening and Feature Mask. Photoshop CS5 used for levels and curves, screen mask invert, lab color, saturation adjustments, selective color, match color, and vibrance. Gradient Xterminator for gradient removal. Carboni Tools for additional noise reduction, and smoothing. Registar for aligning stacks. Notes I had imaged the IFN for the first time last year with my image of the IFN surrounding M81 and M82. I decided I wanted to try a little more challenging and less commonly photographed section of the IFN, and MW2 seemed to be a good choice. The nebula fit the field of view of my 200mm well by doing a 2 panel mosaic, and its a comparatively bright part of the IFN. The image also gave me another chance to refine my skills using Image Plus' new Feature Mask tool to bring out the faint nebula. While the image doesn't have the nice "eye candy" of the M81/M82 part of the sky, I think this nebulosity is quite beautiful. I'm very pleased with the final result in this image.